Electric Tricycles, E-Bike kits, and More! There's always been folks who felt steadier on three wheels than on two! The benefits of slower movement without a struggle for balance, was also something to consider. Some earlier designs used the larger wheels in the rear, but by the turn of last century, we settled for what has changed little since. Your next "grocery store runner"
The beauty of our front-wheel drive motor assist system, is its adaptability! Our powerfull and efficient new "E-1" kit for bicycles works great for most adult tricycles. 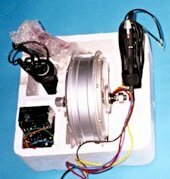 Many thousands of trikes using these quiet, rugged, water-proof hub motors may now be seen on streets and roads world wide. Though the standard 36 Volt version is perfectly adequate for most adult trike applications, we had the controller upgraded to run with 48 Volts of power also. We're confident these kits will suit just about anyone's needs, offering electric assistance to better handle the extra weight of a three wheel cycle. Now featuring "immediate start" electric power, this is a great improvement on hills and for anyone wanting help moving from a stand-still.